In the past few years, the demand for air fryers has gone up. To be frank, I seriously thought of getting one, as I witnessed one of my close friends in pain as he was having high cholesterol content in his blood and he just happened to mention the risk of consuming cooking oil and the diseases it could cause. This is when I decided to avoid using cooking oil or to reduce the use of cooking oil. I thought that purchasing an air fryer was easy, but, later regretted about that thought. 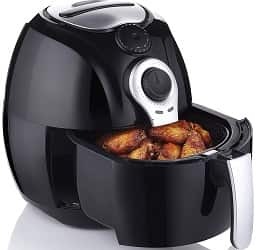 If you go online today in search of an air fryer, you could find more than a thousand models with either the same or different features or specification. I being a beginner could not actually find out the best air fryer from the big list of products available out there. However, it was then I planned to refer a few websites and guides, which eventually helped me gain some deep knowledge on its working and the feature that I should consider while purchasing the product. 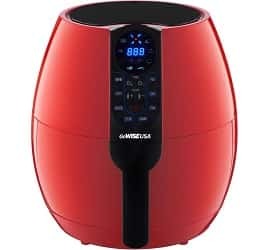 If you are planning to purchase an air fryer, the most important thing you should consider having in your air fryer is variable temperature feature, timer, LCD display, an auto shutoff feature, non-stick pull out trays, and low power consumption. If you prefer getting a product that could suit your kitchen setting, do not hurry on deciding the product, there are over a thousand air fryer models on the market and if you search, you could find the perfect air fryer that could match your kitchen settings. Here is the list of 10 best air fryers available on the market today. 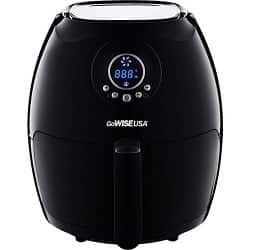 The GoWISE USA 3.7-QuartGW22621 air fryer is one of the most advanced and attractive air fryers that you could get today. The product comes with a touchscreen feature for easy accessibility. The user could manually set the cooking timer incorporated in this product to attain the appropriate cooking. This product is best recommended for those people who love preparing chips, steak, fish, shrimp, and meat. 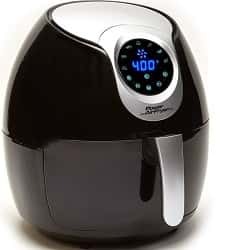 This air fryer is one of the largest air fryers on the market today. The product does have 50% more capacity than normal air fryers. 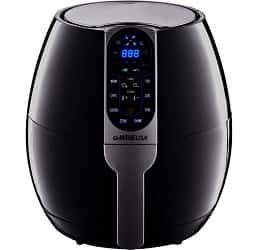 This air fryer from the brand Secura comes with a capacity of 4.2-quart and has a combination of a high-speed air blower for high-speed air circulation. The product is incorporated with indicator lights to notify heating and power supply. The Avalon Bay model AB-Airfryer100B air fryer comes with a capacity of 3.7 quarts and the manufacturer offers a 90-days return back policy. This air fryer from the brand GoWISE USA comes with a wide range of preset timer feature that makes it suitable for frying different food materials. 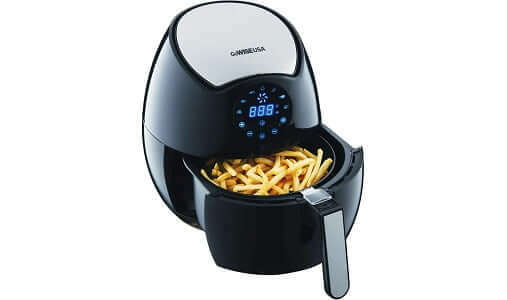 This product comes with a variable temperature feature that allows the user to set and fry their food at any temperature between 170 -400 F.
The product comes incorporated with a digital screen that allows the user to acquire the details like timer set value, temperature, remaining time etc. One of the notable things about this air fryer is that it comes with an alarm that beeps to notify the user when the frying is completed. 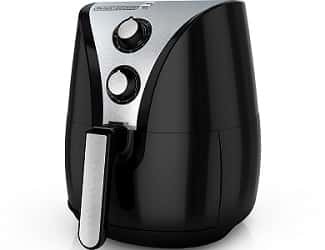 HF110SBD model air fryer from the brand Black+Decker comes with a 2-Liter capacity and boasts high-quality fans and exterior. 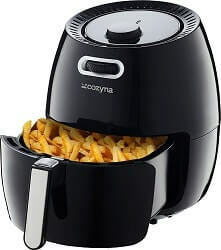 One of the notable and unique features incorporated into this air fryer is the non-stick surface that avoids the food products from sticking on to its surface. This product is perhaps the 2nd largest air fryer on this list. This product is best recommended for anyone who requires frying a large quantity of food. This product is incorporated with rapid air technology that could fry your food comparatively faster than any other air fryers. This product comes with XL size pull out trays that could be used to prepare pizza or any other food products. 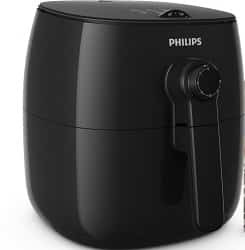 This air fryer from the brand Philips comes with the TurboStar technology that swirls the hot air continuously inside the device in such a way that it could fry the food with ease. One of the notable things about this air fryer is that it comes with non-stick mesh that makes cleaning fast and easy. Power consumption – Air fryers work on electricity and you do know it right? How about the power it consumes? Do you have any idea about it? If not then you should know that air fryers do consume good power. 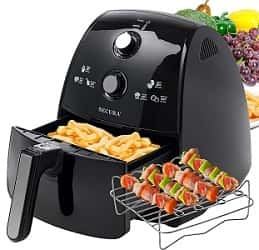 If you want the best, then go for a product with minimum power consumption 1500 watts, however, if you know deep about air fryers and the technology used, you could prefer purchasing advanced devices with lower power consumption. PS: only if you know detail about the product functioning. Not all low power-consuming devices are efficient and advanced. Safety features – Air fryers produce a lot of heat and consume comparatively good power. It is very important that you prefer purchasing a product with well-insulated exterior and top quality components with circuit breakers etc. However, once you purchase the air fryer and start using it, you should remember one important thing. Air fryer has complicated circuits in them and it is very important that you clean the fryer every time after using it. There are many reasons to it and one of the main reasons is the waste or discharges that could come out of the food when it is fried, this could accumulate in the air fryer after few use and lead to malfunctioning or even unhealthy environment inside the air fryer. Step 6: Once the interior of the fryer is cleaned, take a wet warm clothe and then clean the exterior of the fryer. Now, install the tray back into the device and then store the fryer at a clean and dry place. Air fryers are one of the most important kitchen appliances that you should own. Consider purchasing a product from the list mentioned above and get yourselves the best air fryer on the market.